Thailand – January, 2013 – Dymek Thailand receives Purchase Order for EVG®620 Automated Double Side Mask Alignment System from the top National science and research of Thailand name National Electronics and Computer Technology Center. The EVG®620 is high level of automation and reliability, the EVG®620 is a dual-use tool designed for optical double-side lithography and precision alignment up to 150 mm wafer sizes. 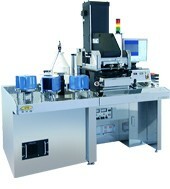 Volume production types and manual R&D systems are available. The fully-automated EVG®620 utilizes a cassette-to-cassette handling system to efficiently process wafers from 50 mm to 150 mm in diameter, regardless of their shape or thickness. The system safely handles thick, bowed or small diameter wafers. The EVG620 superior alignment stage design achieves highly accurate alignment and exposure results while maintaining high throughput.